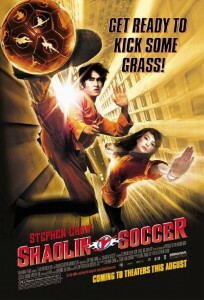 A funny and completely original movie about using Kung Fu skills and some superpowers to play soccer. A fun time at the movies, this film uses martial arts skills, spiritual and mystical energy (which is basically like magic,) and a story about a soccer team. Together, they make for an original experience. The effects here are fantastic, and they really carry the movie along, making each scene about soccer, fun in it’s own unique way. The problem come with the scenes that are not about the soccer team, or at least not on the soccer field. The recruitment of the players is an example of this, where none of the recruitment scenes seems any different than the others. But this is just a tiny part of a movie that is loaded up with cool and refreshing ideas. Aside from all the grandeur and impressive qulaities that using these effects and using shaolin martial arts skills on a soccer field open up, the movie is also quite humorous. Stephen Chow, the movies writer, director, and star, knows how to make the audience laugh. He often does this by emulating classic cartoon moments and brining them to the screen in a live action format. It works. The movie definitely succeeds with it’s energy, humor, and creativity. Shaolin Soccer is a funny movie that combines martial arts with sports in a way that is completely original and thoroughly entertaining. This is a movie by Stephen Chow, a filmmaker who’s next movie, Kung Fu Hustle, was a near masterpiece. 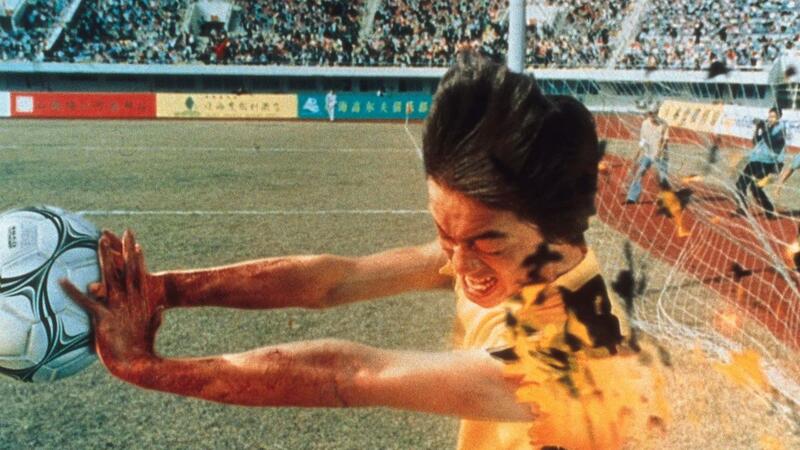 Shaolin Soccer is the warmup film and it is definitely impressive. The visuals are pretty amazing and the use of cool effects help to enhance every scene. The only problem here is the story, which is somewhat cliched and somewhat plain and ordinary. What we have is a basic sports movie story pumped up by unique effects and approach of throwing something spiritual and almost magical into it, and seeing what happens. The movie opens with a flahsback. We see a championship team playing soccer in the finals and the star player, a man named Golden Leg Fung. He misses the big shot to end the game and his team loses. As they walk off the field, we learn that one of his teammates, a man named Hung, is the one who convinced Golden Leg to miss the shot, perhaps offering him a major bribe. Now the mafia comes after Golden Leg and breaks his leg. Hung finds Golden Leg and lets him know that he is the one who told the mafia to do this. Talk about evil. This guy Hung is basically out to get Golden Leg to commit suicide. First the game loss, then the broken leg. This is what I meant earlier about characters and plotlines being a little cliched. On the one hand, it’s almost comical in the sense of, how evil can a person be, but on the other hand, there’s no rational or logistical justification for why Hung would be doing all this, and so it doesn’t seem to add up, other than in making this villain a cartoon character. From here, we move into the present day. Hung is now the coach of a champion caliber team, known as Team Evil. Golden Leg is now an old homeless man walking the streets. He runs into a poor worker, named Mighty Steel Leg Sing, (Stephen Chow.) This worker is doing tricks of balance and asks Golden Leg is he knows or wants to learn the ancient art of Shaolin. Golden Leg scoffs at this and says he has no interest. Sing points out the different things happening on the street around them, such as a woman slipping on a banana peel (again, very cartoonish, and intentionally so, just like using the name Team Evil.) Sing explains how Shaolin could be used to solve all of the problems they see going on around them, including parking cars into tight spaces. Golden Leg continues to be uninterested. Even when Sing takes a can off the ground and kicks it up so fast and so high, that it leave the orbit and blasts off into the sky, Golden Leg could still care less. Sing might not be an old, homeless man, like Golden Leg, but he is still pretty poor himself. He does jobs for wealthier men and spends his time hanging out in the back alleys of the working class. Sing sees a girl who is cooking out behind a restaurant. This girl, named Mui, has a face that is all burnt. She has long hair to help her try to hide her face, but she is clearly saddened by her appearance, and quiet and shy. Mui also has some skill at making dumplings and uses Shaolin to make them. What the basically means is that she uses some kind of magic, throwing buns and dumplings into the air so that they spin around and stretch out on their own. That sort of thing. Sing is impressed. He eats the dumplings, but does not have the money to pay for him. Instead, he tries to sing her a song. This is all meant to be comical. It’s the romantic portion of the film, with the poor boy going up to the balcony window of the woman he is infatuated with, and trying to make her laugh. The real story isn’t about these two and their romance, though. Thank goodness for that. The real story is about a soccer team, and it gets started when Golden Leg is out walking and this time comes across the can that Sing kicked into the air in an earlier scene. The can is now stuck inside of a wall. Golden Leg tries to remove the can, by pulling it out, and he has great difficulty doing so. He eventually gets the can out of the wall, and no sooner does he do this, then does the entire wall break apart and collapse. And right behind it is the school where Sing trains and practices. Does this mean that Sing was actually able to kick the can right to where his school was, or is it coincidence? Golden Leg is now impressed. Finally. He approaches Sing with the idea of Sing using his Shaolin skills to play soccer. At first, Sing is confused, but then he decides to give it a shot. There’s just one thing… he needs a team of others to join him. Sing now spends the next act of the film going around from one friend to another (they are all called brothers, but I don’t believe these guys are really family,) and trying to recruit each of them. And they all reject his offer. These are busy men with lives and jobs. They can’t just give all of that up to start playing soccer. Most of the recruitment scenes are pretty dopey. There’s only one of them that is in any way memorable, and it’s the very first one, where Sing has to join the man he is trying to recruit in getting up on stage, playing music, and singing for the members of a night club. Other than that, each recruitment scene is basically the same. This is a problem and a missed opportunity to get some fun scenes in there. The movie has other plans. Then, one day, the guys show up. All of them. Sing told them that if they were interested, they should meet him on a certain rooftop at a certain day and time, and he’s up there, with Golden Leg, waiting. It seems like nobody is showing up, and then they all do. All of a sudden, one after another. And they go off to a field and start their training. None of these guys is very good. In fact, they are all more or less just a bunch of old Asian men. Golden Leg is pretty frustrated and the guys begin to give up, seeing that they are not qualified for this. But then they see Sing practicing against a wall. He is standing miles away from the wall, and yet every time he kicks the ball it smashes right into the wall, hitting the exact center of a target. He even does one kick where he flips upside down to kick the ball. And every one of these kicks is presented to us in a single shot where you can see both Sing kick the ball, and also the target where the ball ends up. There’s no Hollywood movie magic here, of seeing one shot of him kicking it, and then cut to another shot of the ball hitting the target. Everything here is done in one shot. There are amazing special effects used to make this happen, of course, but the scene looks fantastic. And it’s enough to convince the men who were ready to quit, that maybe they should stay on and give it another try. And so the guys take on their first team. It’s a very physical and violent team who bring out weapons and injure the players of Sings team whenever possible. At one point, one of the members of Sing’s team goes for the ball and all of the members of the other team come sliding into him, from all different directions, as if they are magnetically being pulled into him by an unstoppable force. Sing’s team plays for a while, retaining all kinds of injuries, and then find themselves lying face up on the ground, all beaten down and obliterated. At one point, the movie reenacts a war scene to show us what the experience of being on the field is like. This moment feels forced and unfunny, but the point is still taken. And then Sing has an idea. He tells his teammates to start using their Shaolin skills. One by one, each team member wakes up, as if expressed by a giant fireball appearing behind each one when the ball comes to him. Then each team member uses some kind of unique skill or ability to do something remarkable with the ball. They quickly destroy the violent team to the point where the violent team members beg Sing’s team to allow them to join. From here, Sing and his team challenge team evil for the climax of the film. It does not disappoint and is loaded up with incredible special effects that are both visually spectacular as well as pretty humorous. Shaolin Soccer is a very entertaining film. Even after the competition is over, this movie bookends itself by showing us an actuality of how Shaolin can be used in the real world, referencing ideas that were only mentioned at the start of the film. The soccer scenes are all fantastic. Effects are used here to absolutely enhance every idea we see on screen. The only problem is the story. Stephen Chow loves immitating cartoons and bringing them to life in live action movies. His Kung Fu Hustle certainly did that. There was even a scene in that movie that directly referenced a Road Runner Looney Tunes cartoon. In Shaolin Soccer, it is not quite as obvious, but still the pieces are definitely there. The cartoon element is fine, and often very funny, but it’s the storylines and individual scenes that take place off the soccer field which could have been a lot better. The recruitment scenes, for example, with Sing going to recruit each of his friends to join the team, one at a time, are in no way distinguishable from each other. This sort of thing is a problem. Still, for all of the originality that using these effects and martial arts meets spiritual approach brings to a movie about a soccer team, this movie definitely has a lot going for it. This is a fun experience.